Adis says: Hi. Everything seems to be fine now, everything went well, and I'm less concerned now. Which means, I can spend time in front of the computer! So here it is, an update: I've been asked a few times about how I make the strips and where do I get my ideas, so here's a look at "The Process"!!! (cue to educational music.) I don't think it's all that different from what other cartoonists do, but here it is anyway. First I write the joke down in a piece of paper like the one below. 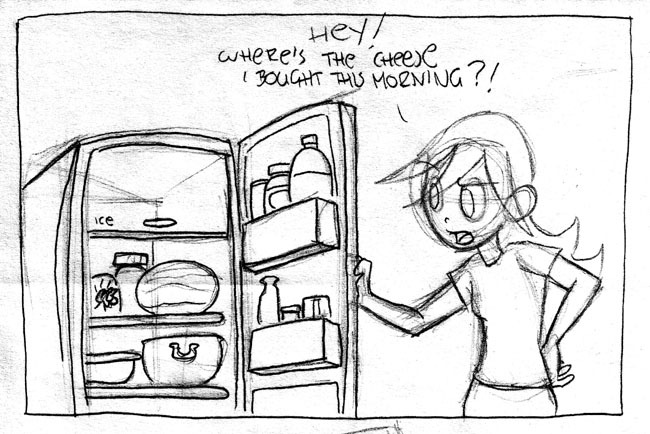 Since the cheese affair was meant to run for a few strips, I wrote the whole thing at once. (Don't worry though, conveniently, the remaining strips are in another page, so dont worry about reading the joke and spoiling the next strips.) I do all the "editing" at this stage, and once I feel the joke works, I move on to the art. 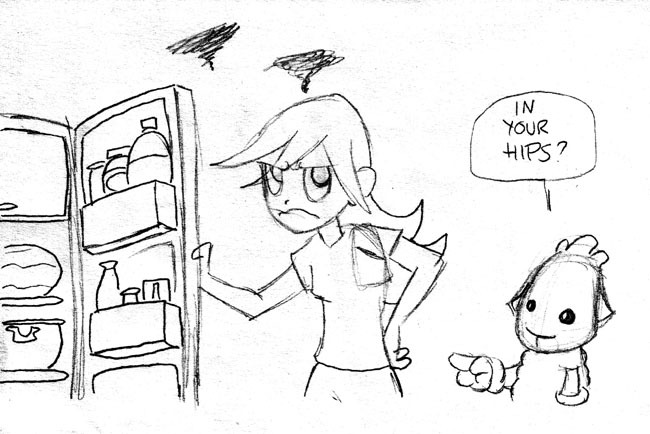 Then I sketch the whole thing, trying to find the right composition. 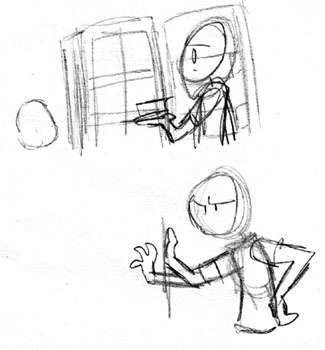 This is to more or less capture what the scene will look like roughly; I try to get all the expressions and poses I feel best suit the story, which takes a few tries. 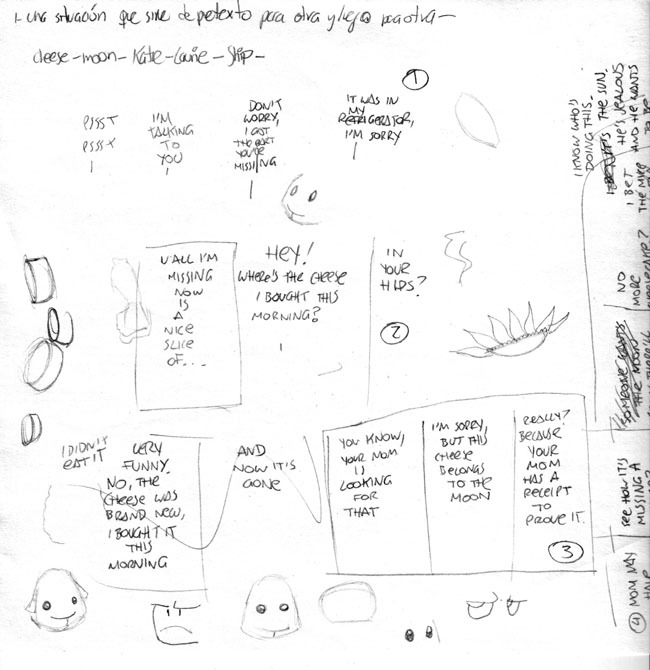 Then comes my favorite part: on a simple sheet of paper, I draw the panels, without any worries about messing up because it's not the final drawing anyway. Thanks to the magic of the lightbox, scenes like this one require less work. I decided that the camera would simply pan a little to the right to reveal Ship. If I had wanted to, all I would have needed to draw was Ship and the change of expression in Laurie's face, but I wanted to have the composition of the two scenes exactly as they would appear in the strip. Sometimes when I'm lazy I skip this part, but the results are always better when you commit a little more time to get it right. Well, now you know. I told you it didn't involve any kind of strange ritual, like sniffing wool or any voodoo like that. I hope you liked this quasi-behind the scenes look. If you emailed me from saturday afternoon till today, you'll probably have noticed I haven't replied. Sorry about that, come tomorrow, I'll catch up. And that's it for today, oh great and lovely readers.